Toluene , formerly known as toluol , is a clear, water-insoluble liquid with the typical smell of paint thinners. It is a mono-substituted benzene derivative, i.e., one in which a single hydrogen atom from a group of six atoms from the benzene molecule has been replaced by a univalent group, in this case CH3. As such, its IUPAC systematic name is methylbenzene. ^ Streicher, H. Z.; Gabow, P. A.; Moss, A.H.; Kono, D.; Kaehny, W. D. (1981). "Syndromes of toluene sniffing in adults". Annals of Internal Medicine 94 (6): 758–62. ^ Devathasan, G.; Low, D.; Teoh, P. C.; Wan, S. H.; Wong, P. K. (1984). "Complications of chronic glue (toluene) abuse in adolescents". Aust N Z J Med 14 (1): 39–43. ^ Wisniak, Jaime (2004). "Henri Étienne Sainte-Claire Deville: A physician turned metallurgist". ^ Podgoršek, Ajda; Stavber, Stojan; Zupan, Marko; Iskra, Jernej (2006). "Free radical bromination by the H2O2–HBr system on water". Tetrahedron Letters 47 (40): 7245. ^ Ji, C.; Egolfopoulos, F. N. (2011). "Hydrogen Flame propagation of mixtures of air with binary liquid fuel mixtures". Proc. Comb. Inst. 33: 955–961. ^ Merory, Joseph (1968). Food Flavorings: Composition, Manufacture and Use (2nd ed.). Westport, CT: AVI Publishing Company, Inc..
^ "Health Effects of Toluene", Canadian Centre for Occupational Health and Safety. ^ "Toluene Toxicity Physiologic Effects", Agency for Toxic Substances and Disease Registry. ^ Dees, C.; Askari, M.; Henley, D. (Dec 1996). "Carcinogenic potential of benzene and toluene when evaluated using cyclin-dependent kinase activation and p53-DNA binding". Environmental Health Perspectives 104 (6): 1289–92. ^ a b c Cruz, S. L.; Soberanes-Chávez, P.; Páez-Martinez, N.; López-Rubalcava, C. (June 2009). "Toluene has antidepressant-like actions in two animal models used for the screening of antidepressant drugs". Psychopharmacology 204 (2): 279–86. ^ Prenafeta-Boldu, Francesc X.; Kuhn, Andrea; Luykx, Dion M. A. M.; Anke, Heidrun; van Groenestijn, Johan W.; de Bont, Jan A. M. (April 2001). "Isolation and characterisation of fungi growing on volatile aromatic hydrocarbons as their sole carbon and energy source". Mycological Research (Elsevier) 105 (4): 477–484. Several types of fungi including Cladophialophora, Exophiala, Leptodontium, Pseudeurotium zonatum, and Cladosporium sphaerospermum, and certain species of bacteria can degrade toluene using it as a source of carbon and energy. Similar to many other solvents such as 1,1,1-trichloroethane and some alkylbenzenes, toluene has been shown to act as a non-competitive NMDA receptor antagonist and GABAA receptor positive allosteric modulator. It is abused as an inhalant likely on account of the euphoric and dissociative effects these actions produce. Additionally, toluene has been shown to display antidepressant-like effects in rodents in the forced swim test (FST) and the tail suspension test (TST). Toluene is, however, much less toxic than benzene, and has, as a consequence, largely replaced it as an aromatic solvent in chemical preparation. For example, benzene is a known carcinogen, whereas toluene has very little carcinogenic potential. Inhalation of toluene in low to moderate levels can cause tiredness, confusion, weakness, drunken-type actions, memory loss, nausea, loss of appetite, and hearing and color vision loss. These symptoms usually disappear when exposure is stopped. Inhaling high levels of toluene in a short time may cause light-headedness, nausea, or sleepiness. It can also cause unconsciousness, and even death. Toluene had also been used in the process of removing the cocaine from coca leaves in the production of Coca-Cola syrup. Toluene has also been used as a coolant for its good heat transfer capabilities in sodium cold traps used in nuclear reactor system loops. Toluene is another in a group of fuels that have recently been used as components for jet fuel surrogate blends. 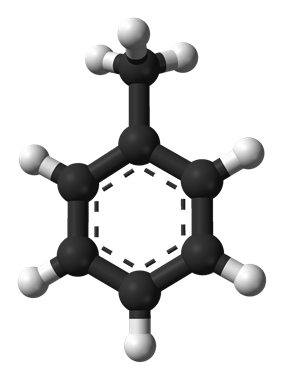 Toluene is used as a jet fuel surrogate for its content of aromatic compounds. In Australia, toluene has been found to have been illegally combined with petrol in fuel outlets for sale as standard vehicular fuel. Toluene attracts no fuel excise, while other fuels are taxed at over 40%, so fuel suppliers are able to profit from substituting the cheaper toluene for petrol. The extent of toluene substitution has not been determined. Toluene can be used as an octane booster in gasoline fuels used in internal combustion engines. Toluene at 86% by volume fueled all the turbo Formula 1 teams in the 1980s, first pioneered by the Honda team. The remaining 14% was a "filler" of n-heptane, to reduce the octane to meet Formula 1 fuel restrictions. Toluene at 100% can be used as a fuel for both two-stroke and four-stroke engines; however, due to the density of the fuel and other factors, the fuel does not vaporize easily unless preheated to 70 degrees Celsius (Honda accomplished this in their Formula 1 cars by routing the fuel lines through the muffler system to heat the fuel). Toluene is a common solvent, able to dissolve paints, paint thinners, silicone sealants, many chemical reactants, rubber, printing ink, adhesives (glues), lacquers, leather tanners, and disinfectants. It is also a raw material for toluene diisocyanate (used in the manufacture of polyurethane foam) and TNT. In addition, it is used as a solvent for carbon nanomaterials, including nanotubes and fullerenes, and it can also be used as a fullerene indicator. The color of the toluene solution of C60 is bright purple. It is also used as a cement for fine polystyrene kits (by dissolving and then fusing surfaces) as it can be applied very precisely by brush and contains none of the bulk of an adhesive. Toluene can be used to break open red blood cells in order to extract hemoglobin in biochemistry experiments. The second ranked application involves its disproportionation to a mixture of benzene and xylene. When oxidized it yields benzaldehyde and benzoic acid, two important intermediates in chemistry. Toluidine is first diazotized with sodium nitrite (NaNO2) and HCl at low temperature. The diazonium compound thus obtained is heated with alkaline stannous chloride (SnCl2). This reaction gives toluene. When toluenesulfonic acid is treated with superheated steam or boiled with HCl, toluene is obtained. When cresol (o-, m-, p-) is distilled from zinc dust, toluene is obtained. When sodium salt of toluic acid (o-, m-, p-) is heated with soda lime, toluene is obtained. The Wurtz-Fittig reaction is the reaction of an aryl halide and alkyl halide in presence of sodium metal to give substituted aromatic compounds. When bromobenzene and methyl bromide react with sodium metal in dry ether solution, toluene is obtained. Many catalysts can be used in place of AlCl3. Their order of reactivity is :AlCl3 > SbCl3 > SnCl4 > BF3 > ZnCl2 > HgCl2. The reaction is not very useful because toluene formed readily undergoes further alkylation at a still-greater speed to produce polysubstituted products. Toluene can be prepared industrially or in the laboratory by a variety of methods. Toluene occurs naturally at low levels in crude oil and is usually produced in the process of making gasoline via a catalytic reformer, in an ethylene cracker or making coke from coal. Final separation, either via distillation or solvent extraction, takes place in one of the many available processes for extraction of the BTX aromatics (benzene, toluene and xylene isomers). With other reagents the methyl side chain in toluene may react, undergoing oxidation. Reaction with potassium permanganate and diluted acid (e.g., sulfuric acid) or potassium permanganate with concentrated sulfuric acid, leads to benzoic acid, whereas reaction with chromyl chloride leads to benzaldehyde (Étard reaction). Halogenation can be performed under free radical conditions. For example, N-bromosuccinimide (NBS) heated with toluene in the presence of AIBN leads to benzyl bromide. Toluene can also be treated with elemental bromine in the presence of UV light (direct sunlight) to yield benzyl bromide. Toluene may also be brominated by treating it with HBr and H2O2 in the presence of light. Toluene reacts as a normal aromatic hydrocarbon towards electrophilic aromatic substitution. The methyl group makes it around 25 times more reactive than benzene in such reactions. It undergoes smooth sulfonation to give p-toluenesulfonic acid, and chlorination by Cl2 in the presence of FeCl3 to give ortho and para isomers of chlorotoluene. The surface tension of toluene is 27.73 dynes per centimeter. The compound was first isolated in 1837 through a distillation of pine oil by a Polish chemist named Filip Walter, who named it retinaptha. This name was replaced shortly after by the word toluene derived from the older name toluol, which refers to tolu balsam, an aromatic extract from the tropical Colombian tree Myroxylon balsamum from which toluene was also isolated later. It was originally named by Jöns Jakob Berzelius.